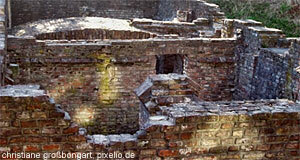 The Domgrabungsmuseum is an underground museum that is located under Dom- and Residenzplatz Square. It gives an introduction to the Roman city Iuvavum, which pre-dated current Salzburg at this site, and buildings that later followed here. The museum is generally best enjoyed with a guided tour, since the walls alone can be rather confusing - after all, this has been the site with the city′s most intensive building activities in the city from Antiquity to the Baroque age. Note that the Domgrabungsmuseum is open only during the summerly peak season. The "exhibition" shows the excavations of various buildings that were examined by local archaeologists. A highlight are the foundations of a Roman villa, complete with mosaics, canals and pipes for warm air that were part of the heating system. Visitors can also see the foundations and parts of the walls of the towers that once flanked the Romanesque cathedral from the 12th century, built under the rule of Archbishop Konrad III. This cathedral was demolished only after an extensive fire in 1598 and replaced by the current Salzburger Dom upon orders of Prince Archbishop Wolf Dietrich von Raitenau. Please note that the Domgrabungsmuseum has rather limited opening hours, only during the summer season (when the number of tourists peaks), you can access it during normal business hours. Otherwise, guided tours can be arranged upon request.